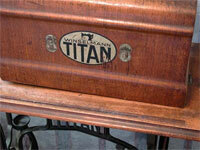 This Winselmann Titan Treadle Sewing Machine was found near Salt Lake City, Utah. It is a German-made machine. 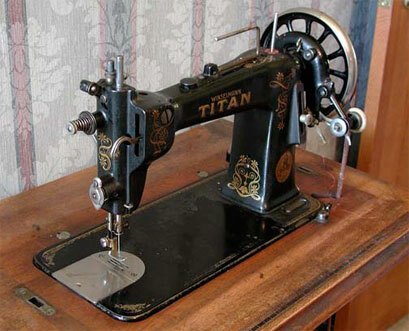 This company also produced many beautiful and highly collectible hand-crank portables. We're guessing it was made in Altenburg, Saschen, Germany based on information on Needlebar website. It is in better shape than most of our other treadle machines. In fact, the bonnet still contains the key. The machine uses a unique bobbin and several are in the single drawer. We tried to do some Internet research on the Titan but everything comes up in German so we are unable to even determine the approximate manufacture date.